Volkswagen’s entry into the popular mid-size, 3-row SUV segment, the 2018 Atlas, has been priced from just $30,500. 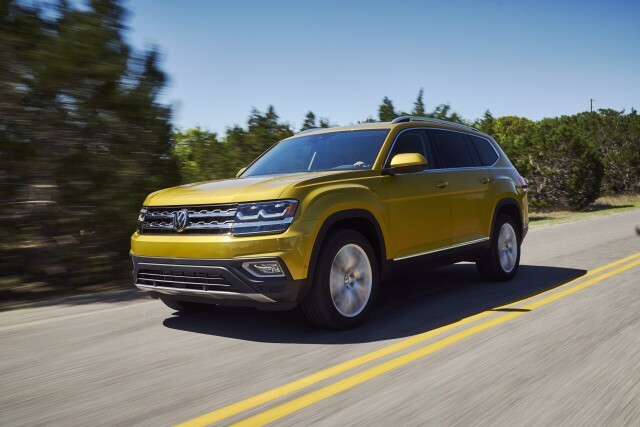 This puts the 7-seat Atlas right in line with rivals such as the Chevrolet Traverse, Dodge Durango, Ford Explorer, Honda Pilot and Toyota Highlander, at least when it comes to pricing. Subaru will soon join this field with a new contender rumored to be called the Ascent. The Atlas arrives in dealerships in May and will be offered with two options for powertrains and five for trims: S, SE, SE with Technology Package, SEL and SEL Premium. The $30,500 figure gets you the base Atlas S equipped with a 238-horsepower turbocharged 2.0-liter inline-4 and front-wheel drive. Opt for the available 280-hp 3.6-liter V-6 and you’ll need to pay $31,900. All-wheel drive is available exclusively on V-6-equipped Atlases and adding this option to the base Atlas S sees the price tag inflate to $33,700. All Atlas models come with an 8-speed automatic transmission, 18-inch alloys, LED headlights, a rearview camera, a 6.5-inch touchscreen-based infotainment system, smartphone integration, a 6-speaker sound system and privacy glass. Premium features on pricier trims include a 12-speaker Fender sound system, a digital instrument cluster, a surround-view camera, and numerous electronic driver assist features including collision warning and automatic braking. Some of the tastier options include twin ‘captain’s chairs’ to replace the three seats of the second row, as well as the sporty R-Line package. The latter is available exclusively on the Atlas SE and SEL trims for $1,960. Production of the Atlas for North America is being handled at VW’s plant in Chattanooga, Tennessee. The only other market the vehicle has been confirmed for is China. All figures mentioned exclude shipping which is yet to be confirmed for the 2018 model year. For 2017, VW charged $820 for shipping. ZTE Axon 7 Mini is under $300 and ready to pre-order in the U.S.